You could call my father a lot of things, but a country music enthusiast he was not. He died four weeks ago today, from complications from Alzheimers. He’d been diagnosed almost eight years ago, and made a slow descent until the last few days, when he suddenly began letting go in a hurry. One of the cruel things about Alzheimers is that you have to hurry to get your “good-bye” in. Otherwise, you get a sad feeling one day that you wanted to say something but didn’t get your point across, followed by the realization that the best conversation you’ll ever have with your parent is already in the past. 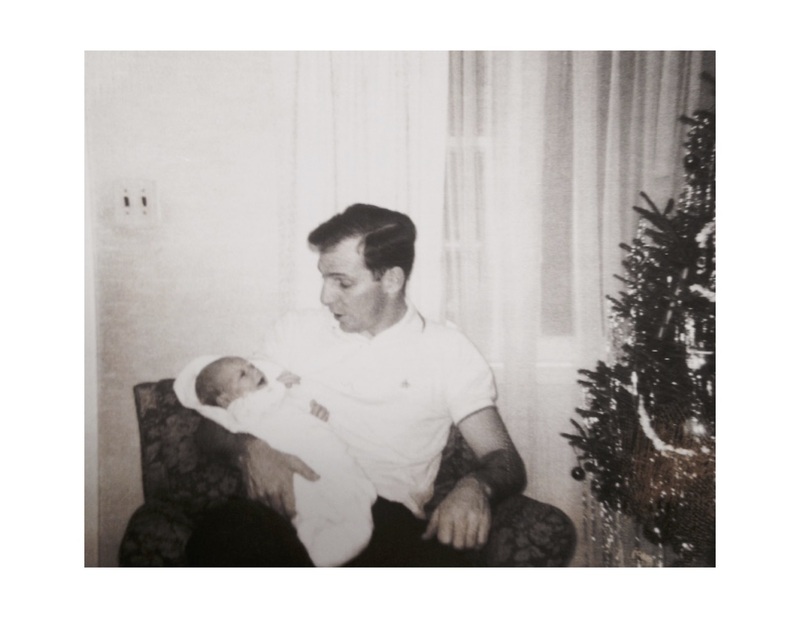 My father Hugh Bowe and me. I had the honor of delivering my father’s eulogy at the Saint Gregory the Great Church, across the parking lot (“the macadam,” the nuns used to call it) from the Catholic grammar school I attended through 4th grade. I felt I’d been handed an opportunity to shape my family’s memory of him. I also knew enough about writing to know that you have to pick one theme, and that’s about all you get. My father was a laboratory glass salesman who learned to golf on “caddies day.” He was a big fan of Dale Carnegie’s How To Win Friends and Influence People. He had a legendary sense of humor that, like Groucho Marx’s, was both charismatic and occasionally cruel at the same time. A working class kid from a broken home makes good, raises a family and becomes a professional, but stays true to his roots, peppered by a few of his funnier anecdotes: That’s a slam dunk of a eulogy, but what was the theme? The spin? The bit of license the eulogist can exercise? I chose to remind everyone what an intensely private person he could be: how, like many apparent extroverts, Hugh needed a lot of time to himself. A lot of miles in his Buick between sales calls across New Jersey. A lot of hours on the driving range. And Friday nights he was always sacked out on the living room rug, listening to The Sounds of Sinatra, with Sid Mark. 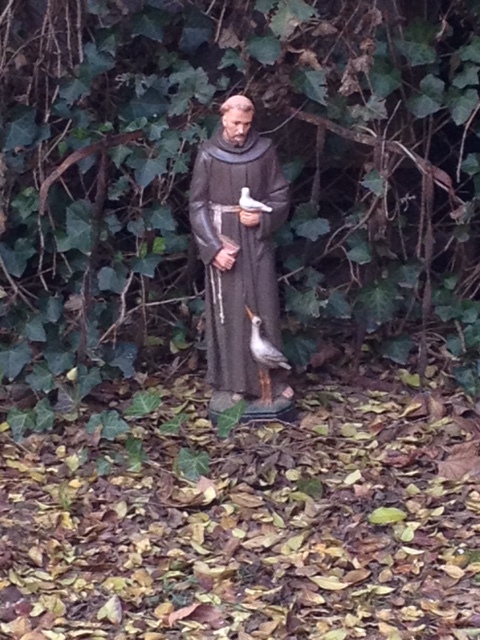 Saint Francis, in my back yard, this morning. I wasn’t around the morning the funeral got planned. I left that to my mother and one of my brothers. I had to come back to the city, ostensibly to pick up my suit, but I managed to turn it into a full day of wandering around by myself. Like father, like son. I didn’t know what hymns they’d chosen, but took it as a matter of course that we’d sing the “Prayer of Saint Francis,” and we did. My father’s taste in music is a topic my family never gets tired of. Sinatra, Mel Tormé, Ella, Sarah, Tony Bennett. He thought Broadway was the epitome of good songwriting, and that Broadway ended in 1960 or so. He loved hearing live jazz, and gave no-name musicians in faraway cities his rapt attention. Any time the topic of poetry came up, he would say that good songs were poetic, and would offer “Lush Life” as the prime example. We played it many times at his viewing. Knowing someone with Alzheimers, you fully appreciate the depths to which music affects the brain. Hugh could sing entire verses long after his ability to hold a conversation had gone. The last few times I saw him, when he wasn’t speaking and didn’t appear to recognize me, you could put on the Mills Brothers, and he’d exhale a low hiss of a laugh. My mother, since age 70, has developed a taste for Led Zeppelin and The Who like never before, but my father never came around regarding his kids’ rock LPs. He was once in stitches listening to “Ziggy Stardust” in the car: “’So where were the spiiiiders?’ What the hell?” Good question, dad. But worse than rock, an aesthetic affront to everything he stood for, was country music. “Shitkicker music,” he called it. He couldn’t fathom why the British invasion bands loved Americana so much. To Hugh, music was aspirational. It must try to be as fine as it possibly can at all times. Country music was crude, maudlin, and politically suspect. As a kid, I figured jazz and jazz singers were the Establishment, the kind of people who got medals at Kennedy Center. To my father, they were the sounds of his ascendant generation, and he was as attached to them as we were to rock. To hell with the stuffy WASPs and their classical music. Ahmad Jamal was as good as any concert pianist. A new kind of refinement was possible, and among its charms it was on the right side of the defining social issue of its day, racial integration, and it was simply excellent music on the face of it. Why on earth would anyone resist it? I had to move to Minneapolis in my 20s to discover country. Saturday afternoons on KFAI radio there was an honest-to-goodness blind, steel guitar-playing deejay named Johnny Field. 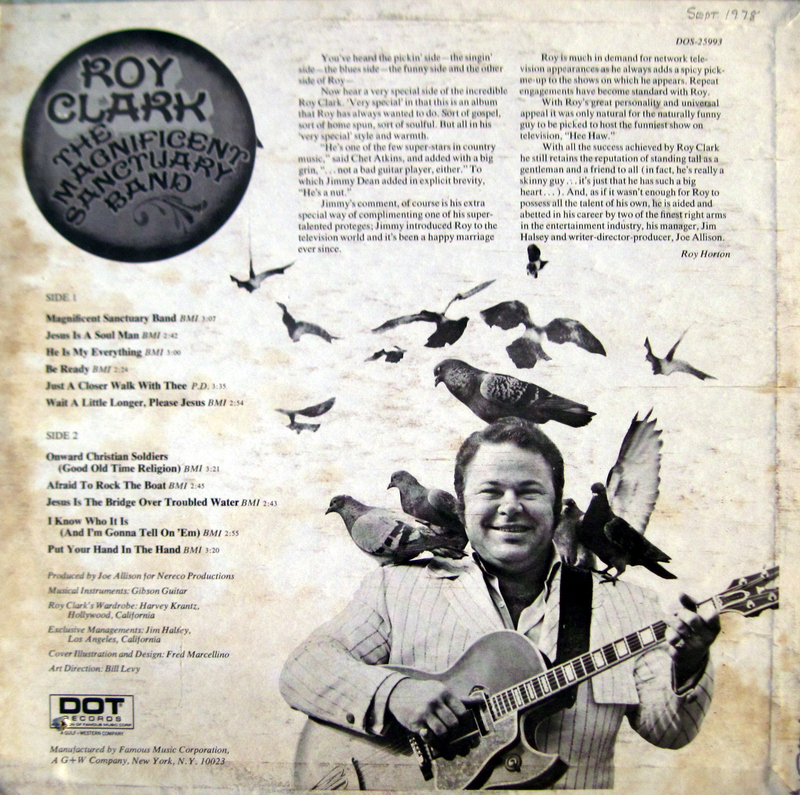 Trying recipe after recipe from The Art of Indian Vegetarian Cooking while smoking Midwestern ditch weed, I was seized by the beauty of George Jones, Ferlin Husky, Kitty Wells, Buck Owens, Hank, Merle, Tammy and many others. These American hymns have gone into standard rotation on my “by myself” playlist – music having become, in Eric Hobsbawm’s phrase, “the aural wallpaper” of life. I confess to a morbid fondness for Catholic dirges, but I’d never listen to “Faith of Our Fathers” while prepping a dinner party. “Wait a Little Longer, Please Jesus,” I could listen to every day, and have been. A few days before my father died, a friend treated me to a Bob Dylan show at the Beacon for my birthday. Dylan’s currently playing a mostly blues set that’s almost entirely his music since 1997. People who’d come for his greatest hits seemed bored, but my friend and I were 100% in. His band is the closest we have to an American La Scala, and he’s Bob Freakin’ Dylan: If he thinks you should listen to blues versions of his new songs for two hours, then that’s what you should do. Like a good Catholic boy, I took his communion and crossed myself. Maybe that cemented my attachment to Americana for the month. Maybe I also just needed to mourn my father, and contemplate mortality, and do so in private. In any case, even for us agnostics, gospel music is waiting to put its arms around us when we need it. One day around Christmas, when the city was blissfully empty, I found myself alone at a bar. Friends had been checking in on me, and I was drinking and crying, and texted one back, “I’m good!” That got me laughing and drinking and crying, and I thought I’d better cut it short. I got on a 2 Train and sat next to a young West Indian guy who, honest to God, was reading How To Win Friends and Influence People. I’ll play “Lush Life” when I’m with the family. I’m sorry to hear about your father, Charles. Thanks for your heartfelt reflection–the music we love is soulful, touching our deep heart’s core. I hope it took you where you needed to go.